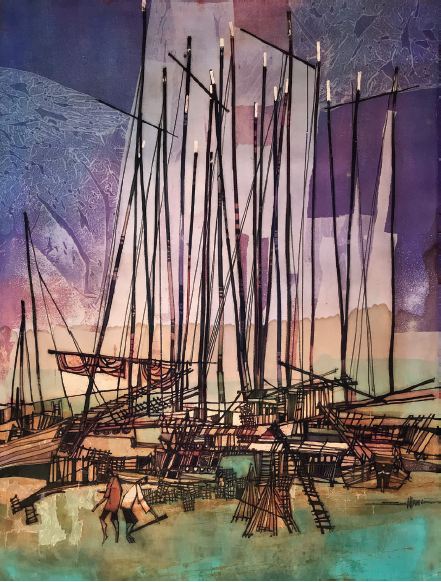 Known as one of the first few advocates of traditional batik-painting, Seah Kim Joo illustrates a contrast of strong and edgy visual in his Junks in Singapore piece, set against a background that suggests a dreamy-like reality. The strong hues of brown of his subjects’ figures stands boldly in front of the pastel and purple tints. The crackling lines of the batik makes this piece an absolute gem. Born in Singapore in the year 1939, Seah Kim Joo was raised in Terengganu, during which he was exposed to the process of traditional batik-making. He studied at the Nanyang Academy of Fine Arts in 1959 before returning to Malaysia to enhance his batik skills through his travels around the east coast. After having won the First Prize at the Malayan Federation Open Art Competition two years in a row, he has then been recognised for his use of dye-and-resist technique in batik. His murals have adorned the Singapore Pavilion, and one of his paintings was selected for Singapore’s commemorative stamp series.